Real name was revealed as Jiang Lihua. 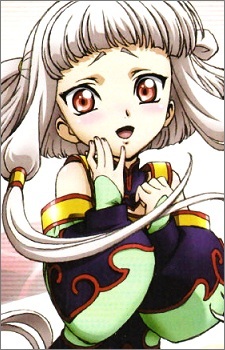 The young empress of the Chinese Federation, thus far referred to only by the traditional title attributed to the Chinese Emperor Tianzi, "the Child of Heaven." In practice, she serves only as a "symbol of the state and the unity of the people", a living divinity whose sovereignty is entirely ceremonial. Actual power is held by the governmental organization known as the "High Ministry". Appearing in season two, she is currently in talks with Kaguya Sumeragi, before the latter returns to Area 11.